This 45 minute workout is designed for use on rollers. It can be adapted for use on a trainer or spinning bike, but only for cadence work. The principles of resistance and position are pretty drastically altered. But if you're looking for a workout for your rollers (and you think you can manage a music player and headphones while you're on those crazy things), this is perfect for you! 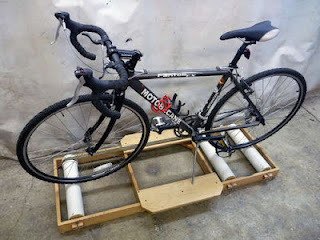 Also, check out this Instructables for a cool how-to on DIY rollers!